You read it here first. Or at least before you read it on "Politico." In his April 21 post, "Democrats Banking on Reform," the highway scribe called the Tea Party movement, "the biggest white elephant in American politics." The post noted that you might be distracted from the divining the true tenor of our country's politics by "an endless barrage of mentions" about that particular group. This was followed-up there by a few details about how damaging the Tea Party might actually be to the efforts of those hoping to topple President Obama. 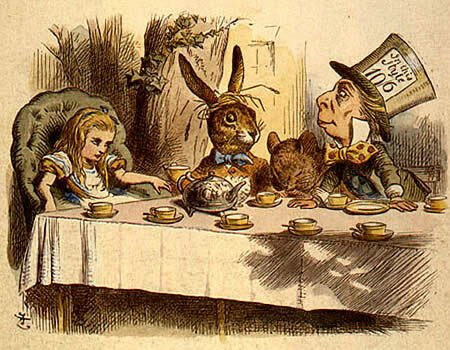 Well, the next day, while highwayscribery's entry was traversing the global system of flows, an infinitely more potent outfit, "Politico," published, "The Tea Party's Exaggerated Importance." The online powerhouse concluded that nothing succeeds like excess and the media has succumbed to this formula in its Tea Party coverage, noting that, "In fact, there is a word for what poll after poll depicts as a group of largely white, middle-class, middle-aged voters who are aggrieved: 'Republicans'." highwayscribery's riposte said: "Essentially Republican voters, the only thing that would make this 18 percent segment of the population newsworthy is if they actually turned on the GOP and helped consolidate Democratic control." "Politico" noted that the Tea Party has "failed to make a dent so far in Republican primaries." In "The WikiLeaks Massacre," this blogger observed that in the lead-up to the Iraq invasion, he marched with "crowds much larger than anything the Tea Party ever cooked up. Unlike that self-centered bunch of hysterics, we were confronted by police sent out to bash heads, because of our opposition to exactly this kind of horror." Or as "Politico" authors Jonathan Martin and Ben Smith put it: "And just a few years ago, hundreds of thousands of Americans turned out to rally against the Iraq war. Now, veterans of those protests -- covered largely as spot news and spectacle -- wonder why they didn't get the weighty, anthropological treatment assigned to the tea parties." (They forgot the part about police knocking the snot out of the anti-war crowd). The "Politico" piece notes that the group's Tax Day crowds [promoted by Fox News as they were] "were not representative of a force that is purportedly shaping the country's politics. About a thousand people showed up in state capitals like Des Moines, Montgomery, and Baton Rouge, and even fewer in large cities like Philadelphia, Boston and Milwaukee." Their reward? The article enumerates a blogger "The Washington Post" hired to cover the "movement," CNN crews that joined the Tea Party Express bus tours, polls in the "New York Times," addressing their importance, and "CNN" (again), and their own outfit. Pew's Project for Excellence in Journalism noted that the Tea Party competed for attention with the Iceland volcano and beat out health care in terms of coverage garnered. The upshot, the reporters say, is that, like Sarah Palin, who couldn't wait to glom onto the Tea Party poopers, they are symbols "that outweigh their actual impact."